Mary Beth would have wanted this picture, taken at our 60th Reunion with her lifelong love Jack, to be posted. 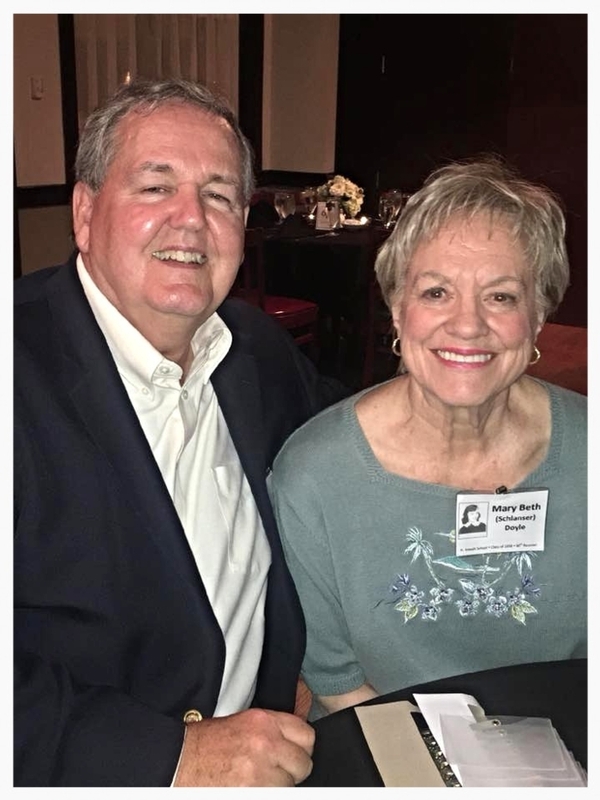 Please see additional pictures and read some pleasant memories of Mary Beth in the "In Memory" section and in Mary Beth's "Classmate Profile". Wake will be Monday, April 22, 3:00 pm – 9:00 pm. at Modell Funeral Home, 7710 S. Cass Ave. in Darien. 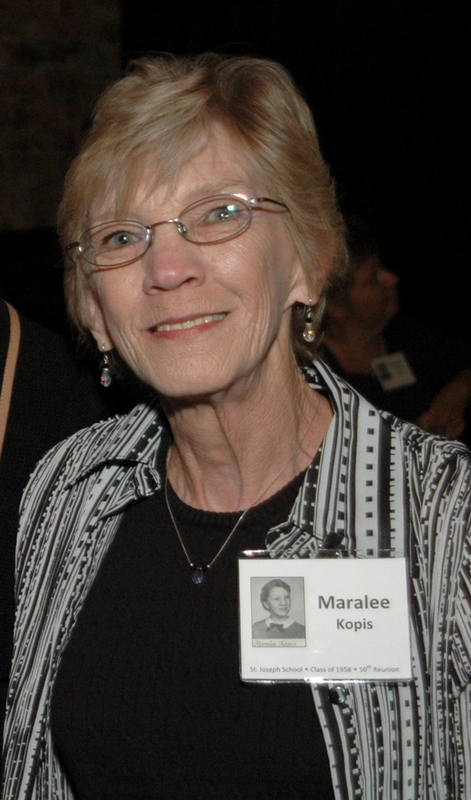 Funeral will be Tuesday, April 23, 10:00 am at Our Lady of Mt. Carmel Church, 8404 Cass Avenue in Darien. Private interment. 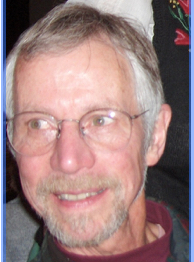 Please see additional pictures and read some pleasant memories of Hal in the "In Memory" section and in Hal's "Classmate Profile". 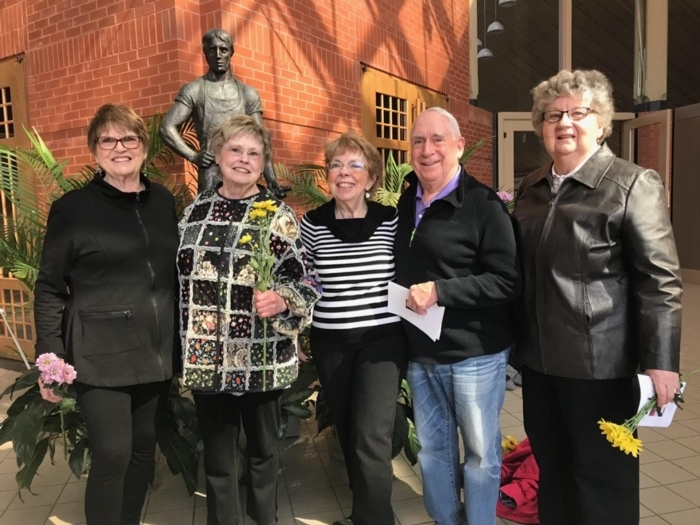 Thank you to Mary, Kathy, Mary Ellen, Ed and Karen for representing us at Maralee's Memorial Mass at St. Joseph's Church in Downers Grove on Friday, March 22, 2019! I found this map in the DuPage County basement records room a few years ago, and it is pretty neat. 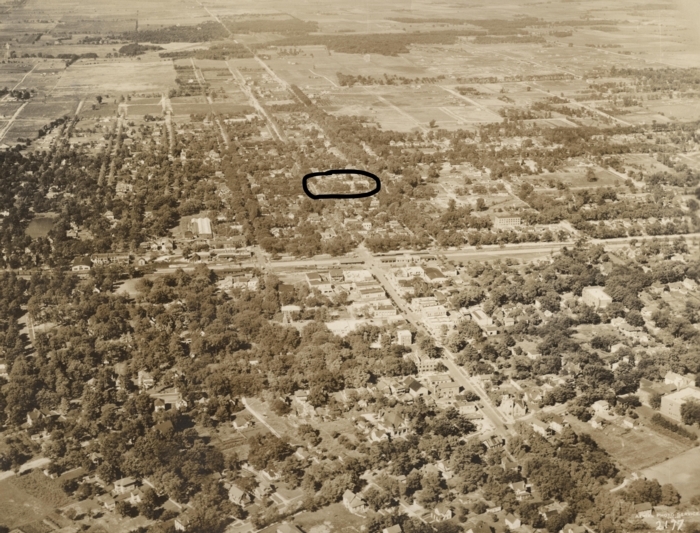 I've circled the location of St. Joseph's Church and School. The amount of vacant land is amazing! I'll put the unblemished picture in the "Photos 1950-58" Teachers & Edifices Tab, and you should be able to open the image and zoom-in. Enjoy! Tom has asked me to say a few words about our deceased and missing classmates, and by implication about all of us. So what can we usefully say about a group of this size? First, we have a lot in common. Our classmates, and each of us, had the magnificent judgment to be born when we were. It almost certainly was the best time to be born in the entire 20th century. It occurred at the beginning of two-plus decades of unprecedented national prosperity. Unlike our children’s generation, we didn’t have to worry about whether we would find employment as adults. Rather, we had to find an answer to the question, “What do you want to do when you grow up”? That’s not to say that their, or our, wishes were fulfilled, but it is to say that we had a better opportunity than most. We also were the children of the Greatest Generation. 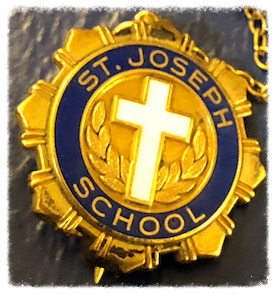 I suspect that we didn’t fully appreciate it during our time at St. Joseph’s, but the fact that our parents lived through, and in one form or another participated in, both the Great Depression and World War II had to have significant ramifications, both personal and societal. Those experiences created and attitudes that were transmitted to us, mostly implicitly. Calvin Trillin once joked that he had been raised in the Midwest to prize modesty—except like many jokes it turned out to be true, at least for the Class of 58. 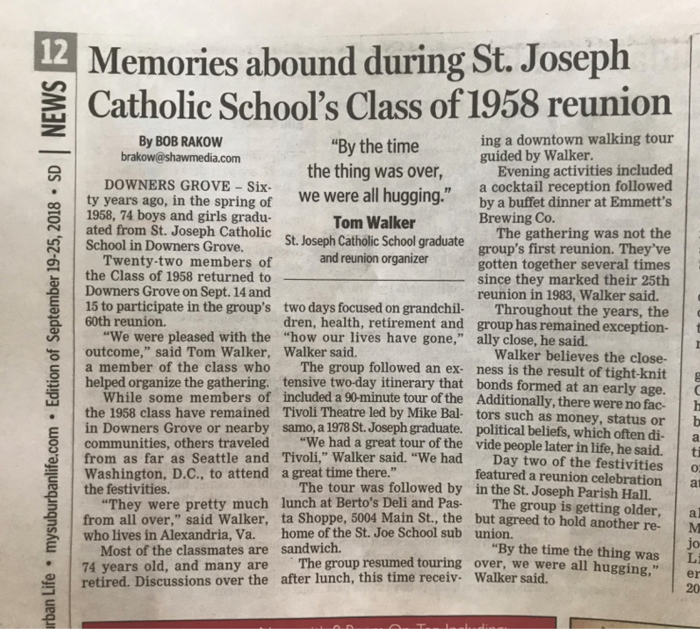 For many of us—perhaps most of us—we came to be in Downers Grove in the 1950s because the dislocations of the Depression and the War brought our parents here from elsewhere. Finding ourselves in Downers Grove in the 1950s seems like a great fortuity in its own right. Our class is a reflection of its homogeneity. To say that it was a simpler time and place than almost anywhere today is an enormous understatement. We had degrees of freedom to come and go that seem unimaginable by today’s standards. Our children and grandchildren have to deal with challenges in reaching adulthood that are a great deal more ominous than what we confronted. We find ourselves placed for socio-economic purposes at the very end of what has been labeled the Silent Generation—at least we escaped being Baby Boomers, who presently are being blamed for almost everything that is going wrong in our society. What might we fairly claim? Each of us, our deceased and missing classmates and each of us, participated in improving the social fabric of our country and in preserving the international order that with some ugly exceptions improved the lot of most people on the planet. We are leaving our children and grandchildren with large, difficult problems, but we can take pleasure in knowing that we are leaving issues of racial and gender equality better—in fact, much better—than where we found them. That’s the kind of thing I try to incorporate when I’m asked to deliver a eulogy. But what can we say that’s a little more personal when we’re speaking about a group? John Donne’s great Meditation—“never send to know for whom the bell tolls, it tolls for you”—is right. We spent our formative years together, interacting in ways that contributed disproportionately to the kinds of adults we became. We are who we are because of one another. We learned how to work, how to contribute, how to cooperate, how to lead. We began to understand our gifts, who we are and who we are not. Some learned how to dance and, it must be said, some didn’t. But we did it together. Any reflection that touches on death has many dimensions. One of them is simply, why are we here when thirteen of our classmates are irretrievably missing? A second is the sense of sorrow at our loss of our friends, and more poignantly their families’ loss of a spouse, a parent, a grandparent. And a third, the unavoidable speculation about ultimate reality. And that brings us back, in a way, to St. Joseph’s School in the 1950s. It may, dare we say, be a place where cosmic reality and certain unhappy memories of the conduct of certain teachers (not to mention instances of PTSD) come together. We were taught religion during a time in which, in the words of a Jesuit friend, “theology was at its worst.” From the distance of six decades, it’s relatively easy to understand what was going on. Our teachers, and therefore we, were subject to a Jansenist strain of Catholicism, almost certainly imported from Ireland—not the most salubrious Irish import compared with, say, Guinness or Irish whiskey. 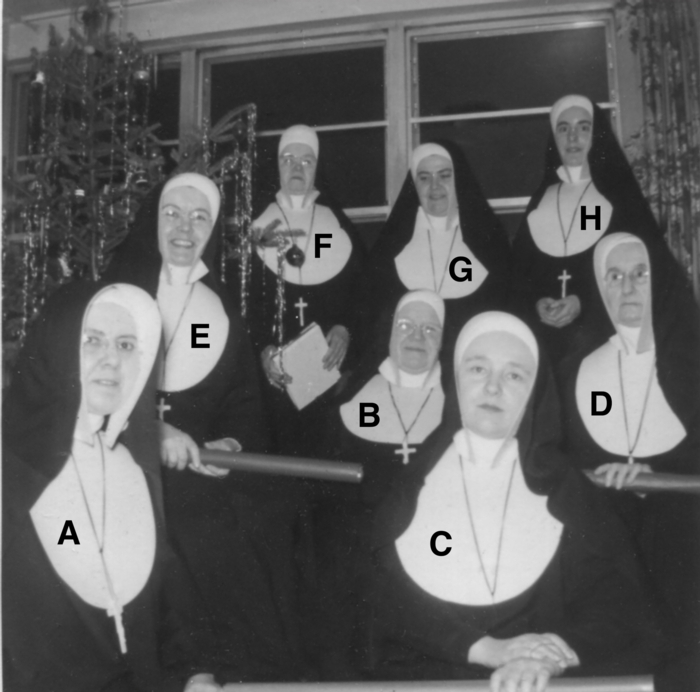 For some of the teachers, especially some of the nuns, salvation involved a desperate struggle. We got a full dose of Jonathan Edward’s “Sinners in the Hands of an Angry God.” Fortunately, at least for those of us who continue to practice Catholicism, times have changed. God isn’t angry any more, or even especially judgmental, but rather merciful. I of course can’t prove it, but it provides hope that our deceased classmates and all of their and our deceased friends, relatives, and benefactors continue to exist and are resting in peace. 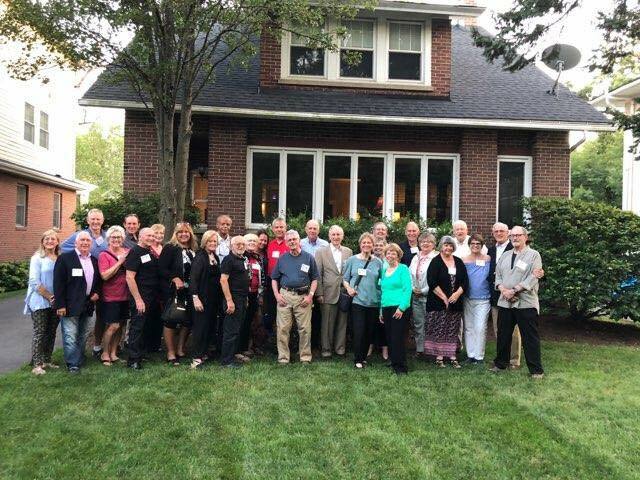 Presented on September 15, 2018, on the occasion of our 60th Reunion. Wonderful that we have this terrific update on the Sisters who served at St. Joseph School from 1950-58. Yes, Sister Adrian Marie is still going strong and living in California and three other of our teachers are also alive and living at St. Mary-of-the-Woods! This preamble was originally written for our 50th Reunion. Today, its message is still valid. As we approach the celebration of our 60th Reunion, let it be known and honored that we come to the event with a multitude of conflicting memories and life experiences. Our expectations and anticipations will be many and various in their level of excitement and, perhaps, even fear. Some of us will arrive at the reunion with painful remembrances, hoping to face down internal demons still resident from not-so-pleasant and long-ago experiences. Others of us will bring to the reunion gloriously vivid memories of a wonderful time, in such brilliant detail that the events remembered will appear to have taken place last week, and not sixty years ago. Let us remember that none of us can confidently claim to know the myriad feelings that will be traveling with our classmates as we all make our respective ways to the reunion. We cannot begin to know the environment that each of us faced individually as a student at St. Joseph School. Our interactions with one another during our student years, and the interactions that we and our parents and families had with priests and sisters during that time, were not uniform nor were they always played out publicly or pleasantly. Likewise, we are not privy to the private experiences that each of us had within our family units; some of us suffered and others of us thrived. Some of us went to school happily smiling and unconfused, while others of us arrived tensed with fear and ridden with anxiety. To complicate matters, regardless of the mental or physical state of our arrival at school, we weren't always good to one another once we were there. In addition to the memories and experiences of our elementary school days, our lives have been further complicated and enriched by life itself. In grade school, we were relatively unburdened by politics, religion, and money; now, however, we have many years of contrasting experience with this volatile triumvirate. Over these many years we have all individually faced life and death, sickness and health, good marriages and bad, ignorance and knowledge, solitude and togetherness, wealth and bankruptcy, and happiness and despair. For those of us who have had the good fortune to survive these intervening years, the impact of these 60 years is nonetheless palpable. These observation are not unique to us as former students of St. Joseph School. They would be valid for any student, at any school, at any time, and at any place. Nor are they meant to discourage our participation in the reunion. Rather, these thoughts are presented to assuage fears, temper anticipations, and heighten our sensitivity to the needs and concerns that we will all bring to the reunion. We are gathering together not just to reconnect and recall juvenile experiences, but to make new and better connections with the people with whom we shared early and significant developmental experiences. We are gathering together not just to review the milestones of our journey thus far, but to strengthen in each of us the resolve to carry on regardless of what lies ahead. We are coming together not to compare or judge, but genuinely to enrich our lives by embracing the totality of one another's experiences. We are gathering together to acknowledge and celebrate the incredible resilience of life as we humans know it, and to seek new horizons in our very complex lives. 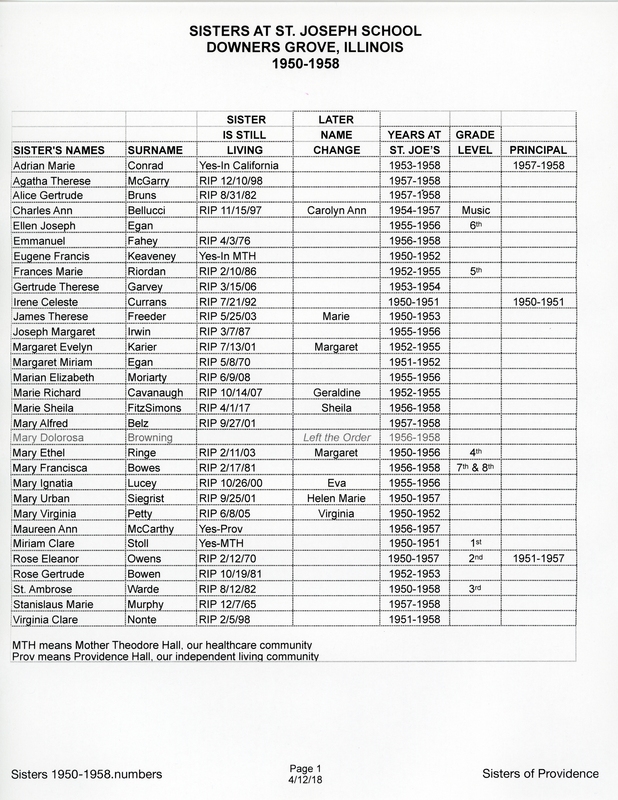 Sister "A" is Virginia Clare, Sister "B" is Rose Eleanor, Sister "C" is Mary Ignatia, Sister "D" is Unidentified, Sister "E" is Mary Urban, Sister "F" is St. Ambrose, Sister "G" is Adrian Marie, and Sister "H" is Mary Ethel. Know the email address of a missing SJS Classmate? Click here to contact them!